I assembled my card using some papers from DCWV's Crafty Christmas stack, adding an embossed Cherry Cobbler strip and some Lil'Inker diecut holly leaves and berries. I smudged the edges of my tag, but I obviously should have hit the sentiment with the heat tool....it smudged all by itself, without my help! It kind of looks like a real chalkboard that way, I guess, LOL! Another one for the pile! It was her idea to adhere the hearts this way....so cute and clever! She also tucked the tag inside the candy-filled cup so that when mommy opened it up, she would see the twine and pull out the tag...another of her own ideas! All three of her creations! Enjoy your day and be sure to pop back in tomorrow for a new Paper Players challenge! Fantastic card, LeAnne! 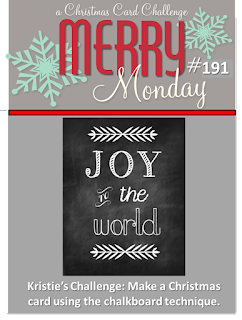 Love the holly berries and the embossing folder you used. Stay warm this weekend!!! Cassidy has some great ideas!!! Her creations look fantastic! Little Miss C is really creative, LeAnne! Darling little, and sweet, clever ideas! LOve your Christmas card, too ... just opening the lid of white pigment ink can be a disaster 'round here! Wow! I LOVE this card, everything about this card! Well, Cassidy, you are so creative. You must enjoy creating and crafting with Grammy. This is such a pretty Christmas card LeAnne. I love the embossed strip and yes the sentiment looks like a real chalkboard. Very pretty card. Love the red embossed strip and pretty tag. Cassidy did a great job with her cups and tag. Perfect chalkboard look, LeAnne! Love the holly with it! Cassidy is showing a real knack for creativity! Hope you all have a wonderful Valentine's Day! Awesome card LeAnne, love every element. Thanks for joining us this week. An amazing card fantastic demonstration of a Chalkboard card. Love the plaid and that sweet chalkboard tag, this is fantastic LeAnne!! Cute little treats Cassidy made. She's got some terrific design ideas!! Love, love love your card...so unique in all its elements! That Christmas card is just right. Cassidy really has the gene.